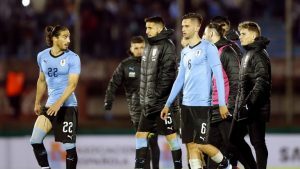 Uruguay stepped up their FIFA World Cup preparations as they won the match against Uzbekistan with ease. The lead was taken by Uruguay in the first half of the match. And, it was de Arrascaeta who scored the goal from 15 yards to put Uruguay in the lead. Uzbekistan looked to fight back but couldn’t score a goal in the 1st half as it came to an end with Uruguay in the lead. In the 2nd half, Uruguay striker Luis Suarez further increased the goal lead as he managed to score a successful penalty at the 54th minute. On the other hand, Uzbekistan were not being able to get past Uruguay’s defenders, thus they were not getting much chances to score. However, they needed this win as they had lost their last two matches in a row and were trying to avoid a 3rd defeat. But, Uruguay were pretty adamant to win this match as Giminez struck another goal at the 73rd minute to make it 3 – 0. This was also the final score of the match and this win means that Uruguay has now lost only 1 match of their previous 9 games. Having lost their last 4 matches in a row, Lithuania hoped to beat Iran and find some solace through a win. Meanwhile, Iran hoped to forget their previous loss to Turkey as they wanted a win to step up their preparations for the upcoming FIFA World Cup 2018. So, the match started as both teams kept things tight in the 1st half as no goals were scored it. The defenders of both teams continued their excellent approach in the 2nd half as no chance of a goal was being created. Only 3 minutes were left in the conclusion of this match and the team that scored at this point would eventually win the match. Luckily, it was Iran who became the lucky team as Azzmoun netted the ball at the 88th minute and Iran won the match. After suffering 3 consecutive defeats, Croatia finally managed to get a win after they beat Senegal by 2 – 1. This was also the last match for Croatia before the FIFA World Cup 2018. And this win on their cards would definitely increase their morales before the mega event in Russia. The first half of this match was a tight one as no goals were scored by either side. The efforts of Senegal were excellent in the 1st half as despite being low in ball possession they managed to keep Croatia from scoring. After the break, the 2nd half went underway and Senegal’s forward, Sarr didn’t waste any more time as he scored the opening goal of the match at the 48th minute. Croatia began to counter-attack but were constantly being blocked by Senegal’s defenders. And, it was not until the 63rd minute that Croatia’s captain Modric assist helped Perisic to score a goal and level the scoreboard. Both teams now needed a goal to get in the lead and win the match. Senegal’s Sadio Mane took a great chance but the ball deflected off the post. However, some time later Croatia’s Kramaric sprung the crowd into action as he scored at the 78th minute. This goal was more than enough to win the match for Croatia as they ended their losing streak with a win. This was a chance for Switzerland to complete their unbeaten record in the International friendly matches before the FIFA World Cup 2018 in Russia. On the other hand, Japan having lost their last two matches hoped for a win in this match. In the first half of the match, chances were being taken by both teams but defending was exceptional on both sides. However, Switzerland got lucky after Yoshida fouled Embolo and they got a penalty. Switzerland’s defender Ricardo Rodriguez took the shot and was successful in netting the ball. After this goal, the 1st half of the match concluded with Switzerland in the lead by 1 – 0. Japan tried to come back strong in the 2nd half but were constantly being denied a scoring chance. On the other hand, Switzerland increased their lead by another goal as Seferovic struck at the 82nd minute to make it 2 – 0. This goal proved to be match winning and Switzerland will now move to FIFA World Cup 2018 with an all-win record. 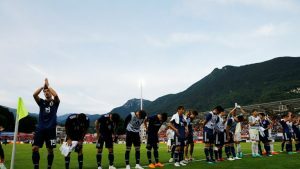 Switzerland’s defending was superb in this match as despite most of Japan’s shots were stopped by the goalkeeper; A sensational effort. 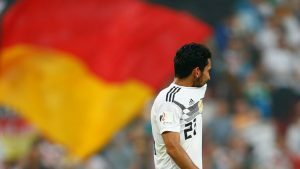 The defending champions of this FIFA World Cup 2018, Germany needed to set their record straight after they lost their last match to Brazil. On the other hand, Saudi Arabia also needed a win to avoid a 3rd consecutive loss prior to the FIFA World Cup 2018 in Russia. And early lead was taken in this match by Germany as Werner struck at the 8th minute of the match to put Saudis under pressure. This lead was further extended by Saudi Arabia’s Omar Hawsami who scored an own goal at the 43rd minute. The 1st half ended with Germany in the lead by 2 – 0. Saudi Arabia put quite an effort in the 2nd half of this match as they began to strike constantly at their opponents goals. These efforts bore fruit as Al-Jassim struck at the 84th minute of the match to give his team some hope of drawing this match. But, it was not meant to be as Germany held on tight in the last few minutes and eventually won the match by 2 – 1. Saudi Arabia is improving. Victories over Greece, Algeria, and now a narrow 1-2 loss vs Germany. Egypt hasn’t won a single game in 2018. The last match of the day was an eventful one. As, a total of 4 goals were scored by each side but it eventually ended in a draw. The lead in this match was taken by Poland as Bayern Munchen’s striker Lewandoski netted the ball at the 30th minute. Only 4 minutes had passed and Piotr struck the 2nd goal for Poland to extend the lead to 2 – 0. Chile weren’t going to hold back at this point as 2 minutes later Valdes struck to make it 2 – 1. This was the score at the end of the 1st half. In the 2nd half, Chile managed to level the scoreboard, courtesy of Miiko Albornoz who scored at the 56th minute. No further goals were struck by any team at this point and the match came to an end with the final result being 2 – 2.